Sonic has added String Cheese (the first fast food restaurant to do so) to their Wacky Pack kids' meal in an effort to help kids get their calcium. 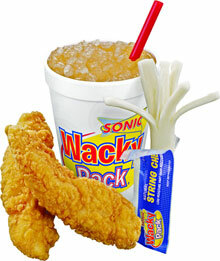 Sonic also plans to begin offering bananas to the Wacky Pack in October. "SONIC believes in the importance of healthy lifestyles and supports a balance of nutrition and exercise," said Paul Macaluso, vice president of marketing for Sonic, America's Drive-In. "String cheese is a perfect food item to maintain a healthy balance, especially if your kids are picky about what they eat. Kids love string cheese and it's a fun way to help them get the calcium, protein and other nutrients they need as part of a balanced diet."